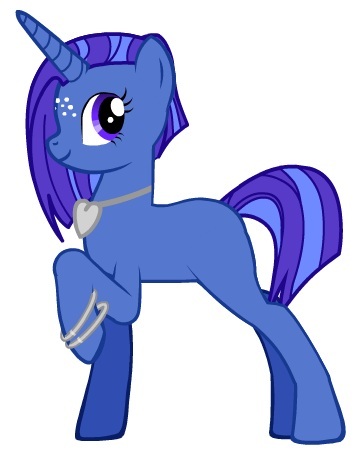 I've been fiddling around on pony generators for months on end, trying to create a persona for myself, but I never felt comfortable with anything I designed. Though I have an eye for detail and am particularly sensitive to colours, I don't have a fantastic grasp of colour theory, and I always felt that my colour schemes looked terribly flat and uninteresting. I tried going for a white pony to create contrast (and because I love white ponies), but then I worried that she looked too much like Glory or Rarity to be unique and truly "mine". In the end, this is the design that stuck with me. I came back to it over and over again, and eventually figured, what the heck, she obviously wants to look like this, so I'll leave her be. For now, at least. Like I said before, the hairstyle is incorrect (I prefer long, beautiful flowy tresses), but overall I'm fairly happy with how she turned out. The colours are a bit on the dark side, but I like it, it offers a bit more contrast than the ones I made using the generator. The cutie mark here is probably something more "ladyofthenight"-ish, though. 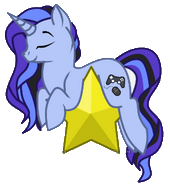 If I had to give Level Up a cutie mark, it would be something like a PS3 controller, 3DS or mouse, or a combination thereof. I'm a gamer at heart, and RPGs are my thing, hence "Level Up". After a bit of thought, I made her a unicorn, because as much as I like feathery wings, I'd rather be able to cast magic than fly. 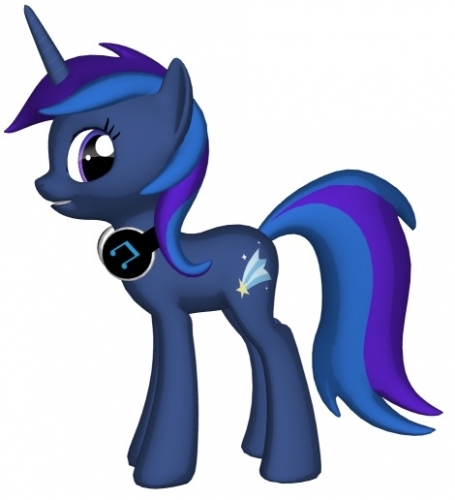 And her design and colours are a mixture of a few of my favourite ponies across the generations – Luna (specifically gamer Luna... perhaps looks a little too similar to her, tbh), Glory, Night Glider, and Clever Clover. I'm still working on the design, and maybe it will change entirely, but for now this is what I've been toying with. 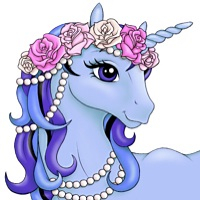 For laughs, here's what she looks like using Baby Blue Bell's pony maker (which has a limited selection of colours, hence the total inaccuracy). The expression pretty much says everything about her. I think your colour selection is spot on, regardless of any hesitation you may have! I think they're very complimentary to one another. I love the dark, cooler colours you've chosen. I'd love to see Level Up in her socks. Being a huge minty fan, I do adore a mare in socks! 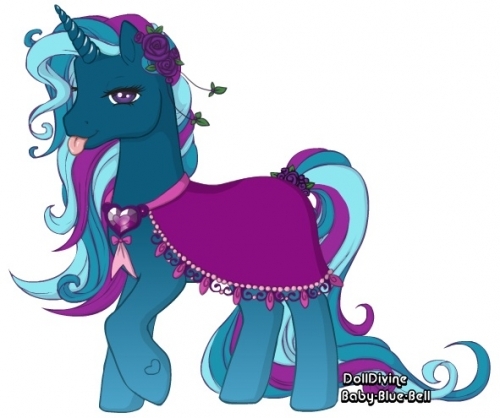 And even though the colours might not be what you want in the last Pony, her saucy attitude is just perfect I think ! LOL! I love them all! I think you've done a bang up job. Put that together quick using the ponycode that I had saved. It's actually hard to decide which one of them I like more! 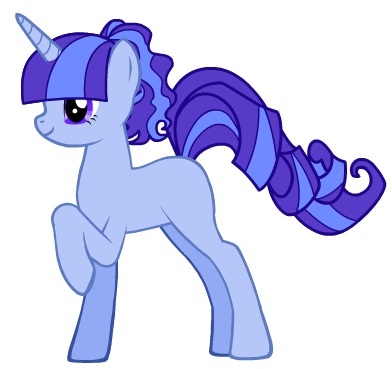 If I go with this one, I'll make my boyfriend a ponysona that's dark like the previous version. Like we both love games, we both love the colour blue – they'd make quite the set! Though I'm not sure he'd appreciate having a ponysona... He supports my pony obsession, but he's definitely not a brony. P.S. I love playing around with the hairstyles on these things! I'd love to see Level Up in her socks. Being a huge minty fan, I do adore a mare in socks! 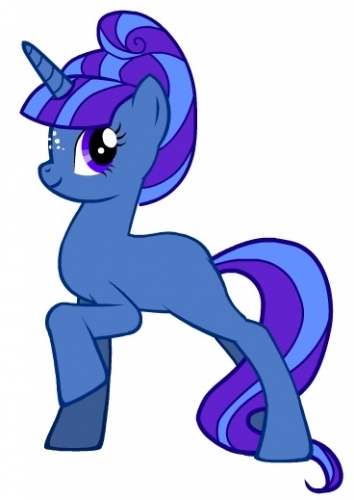 I love socks, and I love socks on ponies! Pity that none of these generators has socks! I'll have to draw her soon. 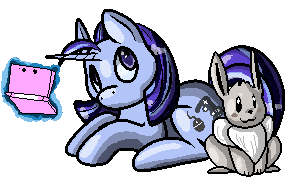 I also have a very nice pixel art base of a pony in socks that I should use. Base is by softybases on DeviantArt.